Angel investors are helping create jobs while big corporates are reluctant to invest. Time the taxman realised that. About three years ago, Anup Kuruvilla left his corporate banking job in Hong Kong to return to Bangalore and assemble a group of wealthy individuals willing to place small, early-stage bets on fledgling founders. 1Crowd, the platform Kuruvilla and his partners helped set up, has 500 investors. Members co-invest with 1Crowd Fund, sharing the risks in mentoring young ventures: Some are bound to fold. The first successful exit, likely to occur when any of 1Crowd’s current stable of 21 firms goes in for Series B funding, is still some ways off. The name of the game is patience. And that’s one thing in short supply with the Indian government. The revenue authorities have been hounding tiny companies over money raised from investors, claiming their valuations are fraudulent and slapping them with a 30 percent tax, as though the fundraising is income. The “angel tax” has left early-stage investors exasperated. A recent clarification on how startups can seek exemption from the levy has made things more complicated. Yet the tax department’s overreach hasn’t dimmed the Indian startup community’s optimism. There are three reasons: last year’s $16 billion sale of Bangalore-based Flipkart Online Services Pvt. to Walmart Inc.; crashing local data prices; and the embrace of artificial intelligence by the outsourcing industry. Serving the U.S. business market from afar has been the traditional route to success for Indian tech. From the days of the Y2K bug, throwing cheap and abundant code-writing talent at business problems of Fortune 500 corporations is what earned Bangalore its edge. Flipkart’s lucky break notwithstanding, the newest startup vintage is also wary of rushing headlong into domestic consumer-oriented businesses. Success in this market of 1.3 billion people is all about hefty price discounting underwritten by brute money power. TaxiForSure was doing well, but it didn’t stand a chance against SoftBank Group Corp.-funded Ola, which bought the Bangalore-based ride-hailing app in 2015 for $200 million. Satej Sirur, a Cornell University computer scientist who was TaxiForSure’s head of strategy, is back to serving the U.S. market with an online tool to make professional-looking short videos in a few minutes at a fraction of the usual cost. Rocketium gets 45 percent of subscriptions from North American businesses, nonprofits and universities. We’re still talking about $250,000 in annual revenue for Rocketium and just about double that for HappiDoc, but it’s a start. Even as retail, grocery, food delivery and ride-hailing become a preserve of the better-funded firms, digital media is flourishing. At 6.8 gigabytes per month, mobile data usage per active smartphone is more than in Western Europe, and double Latin American levels. By 2024, Indian smartphone ownership is forecast to almost double to 1 billion. Reliance Jio Infocomm Ltd., the mobile operator that unleashed the price war in India’s data market, destroyed thousands of telecom jobs as rivals were forced to merge or shut. But Jio’s impact on entrepreneurship shouldn’t be underestimated. If HotStar, 21st Century Fox Inc.’s local-streaming platform, rode India’s data revolution to acquire 75 million users by the end of 2017 (versus 5 million for Netflix Inc.), it was because a cricket-crazy nation wants matches for free, and advertisers are happy to finance this habit. 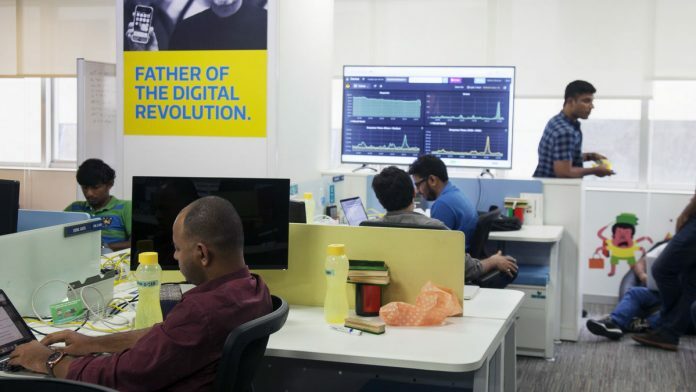 Google executive Kavita Shenoy and operations researcher Anand Gopal quit their jobs to help HotStar track delivery of all the promises they were making to advertisers. Now their company, Voiro Technologies, sells its software to several digital publishers and streaming apps. For the dozen Indian startups worth more than $1 billion, there’s no dearth of financing. The likes of 1Crowd, whose sub-$700,000 checks provide the first flush of capital, are still rare though. “It’s a cottage industry,” as Kuruvilla says. Here again, the good news is that Sequoia Capital, the Silicon Valley venture firm that backed Apple Inc. and Airbnb Inc., is stepping up to the plate, offering $1.5 million in seed funding.